Martin Luther once said of the Athanasian Creed: ‘I doubt whether the New Testament church has a more important document since the Apostolic Age.’ However, in our day, the Athanasian Creed is not nearly as well known as it was in Luther’s day. The Athanasian Creed is like the Apostles’ in that its author is unknown. It was written later than the Nicene Creed, appearing in its complete form near the end of the eighth century. It was wrongly attributed to Athanasius at first, but has kept that title because of Athanasius’ defense of the deity of Christ and the Trinity – the two main subjects of this creed. The Athanasian Creed is an excellent summary of the decisions of the first four ecumenical councils (Nicea – 325, Constantinople – 381, Ephesus – 431, and Chalcedon – 451) against various and many false teachings concerning the fundamental teachings of Scripture. In the years 400-800 A.D. false teachers arose who began to deny the doctrine of the Trinity and the person and work of Jesus Christ. For this reason, the ‘Athanasian Creed’ deals with the most fundamental Christian truths of the Trinity, the Deity of Christ, and His redeeming work. Our ultimate salvation is at stake because without knowledge of these truths saving faith is impossible. The term ‘uncreate’ reminds us that all three persons of the Holy Trinity (Father, Son and Holy Spirit) are equal and without beginning or end. The Son was not ‘created’ by the Father, nor was the Holy Spirit ‘created’ by the Father and the Son. All three persons have existed from eternity as one united equal God. The creed also goes into detail (‘perfect God and perfect man’; ‘one altogether; not by confusion of substance but by unity of Person.’) to show that Jesus Christ was at once fully God and fully man. Jesus was not half God and half man, but as incomprehensible as it seems both immortal and mortal at the same time. Good Works are those things done by believers in the true fear and love of God – for Jesus’ sake. The writer to the Hebrews writes: ‘Without faith it is impossible to please Him’ (Hebrews 11:6). These will stand as evidence of true faith in Christ, which alone saves. James declares: ‘Thus also faith by itself, if it does not have works, is dead’ (James 2:17). In contrast to the peaceful tone of the Apostles’ and Nicene Creeds, the Athanasian Creed begins and ends with the strong condemnation: ‘This is the catholic faith; which except a man believe faithfully and firmly, he cannot be saved.’ While many have opposed this harsh wording, the same is taught in Scripture: Jesus said, ‘Therefore I said to you that you will die in your sins; for if you do not believe that I am He, you will die in your sins’ (John 8:24; cf. Acts 4:12, Mark 16:15-16). Let us continue to proclaim both the Law and Gospel of Scripture to today’s world! D. Paul Bakthavachalam is president of Berea Evangelical Lutheran Church. When we had a division from the former head of the BELC, D. Paul was the vice-president and stayed with us as did most of the pastors at that time. Since then, there has been steady growth in the church body. About two years ago after four years of not accepting new men for study in the districts, a new batch of 174 men were accepted for study. We praise God for the interest of these men in our sister synod’s work. It certainly was not an interest in earthly gain, as we do not pay salaries from the states for these men nor from any central purse of the BELC. The Word of God is alive an active working in the hearts. Of the new men who entered study and the oldest of them bore the same name as D. Paul, but is not related. D. Paul recently wrote how this man was doing. 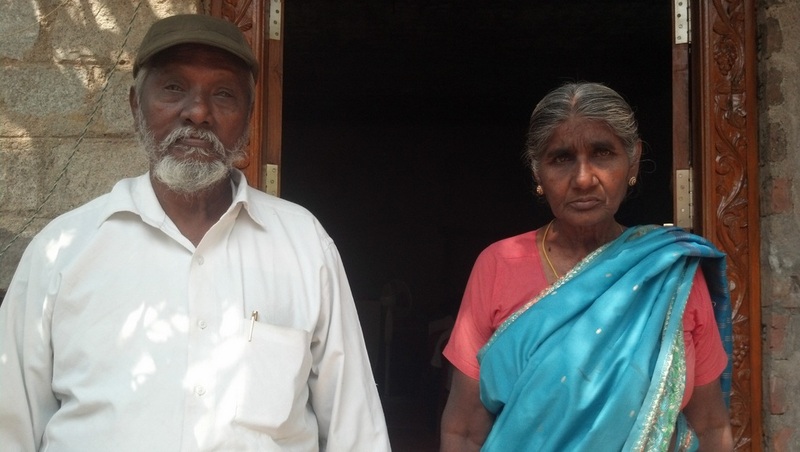 “G.D.Bakthavachalam aged 77 years is one of our BELC pastors under the Chittoor District. His wife’s name is Usha Rani age 55 and has some mental disorder. He has two sons: one son left in his 21 years old and he will not likely yet return back, one son is studying with us in our Madanapalli Bible classes. Meetings with interested pastors were held in G.D.’s partially completed church. He came by bus to our new meetings at Chittoor District which was a long ways away. Sometimes he missed classes due to back problems. But he completed the studies and joined us. He is one of the oldest of BELC pastors with a white beard and sparkling eyes.